The Kerrison Punch is available in two different angles – 45 degree and 90 degree and varying in up tip and down tip. It is also offered in two different working lengths. We have different shaft varieties like bayonet shaft for MIS and curved shaft for amniotomy. 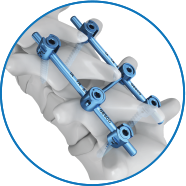 5 different dimensions and 5 different width selections are offered, thus covering all the needs in different spine surgical procedures. We even offer thin foot plate Kerrision Punch.